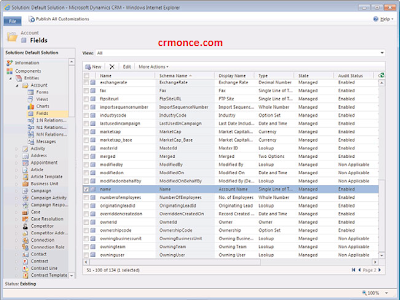 Similar to an XML document, all objects in Microsoft Dynamics CRM are treated as an entity or an attribute. Account, Contacts, Activities, and so on are all entities in the CRM system, and every entity has attributes, related to the entity, which are now called fields on this new version of CRM. An example of this is Account and Account Name. Account is an entity and Account Name is a field (see Figure 23.2). This new version now enables us to create entities of type of activity, which was not allowed on previous versions. Lets we can see one by one in the below. Single Line of text (nvarchar type):Used for small texts or strings. Option Set (picklist type):Used for drop-downs or combo boxes, with a limited set of fixed options. This is what was called picklist on previous versions.Option sets on this new version of CRM are much more powerful and reusable than previous versions. You can reuse the same option set on more than one entity. Lookup (lookup type):Used for lookup other entities relationships Depending on which type you use, option sets have different properties.Entities are associated with other entities via a customization referred to as a relationship. The remaining two concepts relationships and messages i can explain completely in the next article.